I started work on a library to make graphing a bit easier. The code below runs on a Pixl.js, or any other device as long as you create a Graphics instance called g.
Graph the given array of data. if (y>g.stringWidth(t)/2) // does it fit? Automatic X scrolling (when defining a window width)? Nice work, by the way ! Having the ability to mark a point and display its value would be great, and as you say @Jean-Philippe_Rey being able to move it around to find a value would be really handy. Gauges would be good too - but probably best for another module? I'm not convinced that a grid would be that useful on the Pixl display - on something with grayscale it'd be really good though. 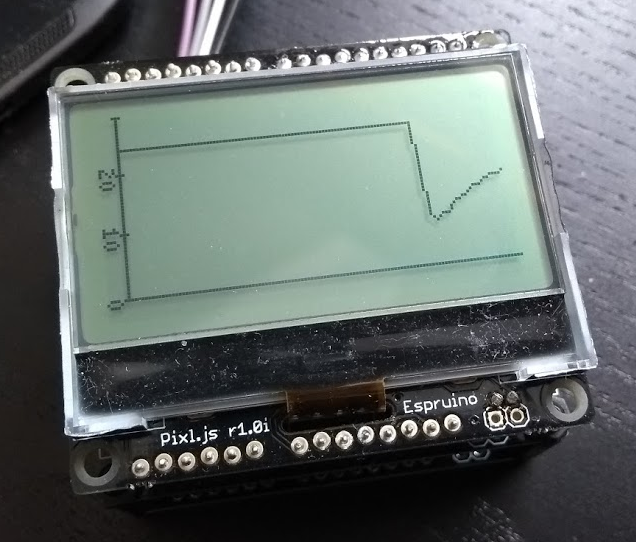 @Spocki do you have an example of how you'd want those things shown on the graph? Having stats in the history module would be extremely handy though as you say.